Mobile Manager supports Apple’s Device Enrollment Program (DEP) for iOS 7+ and OS X 10.9+ (Mavericks). Wirelessly enroll and supervise devices without the use of Apple Configurator. Prevent Students from removing profiles. 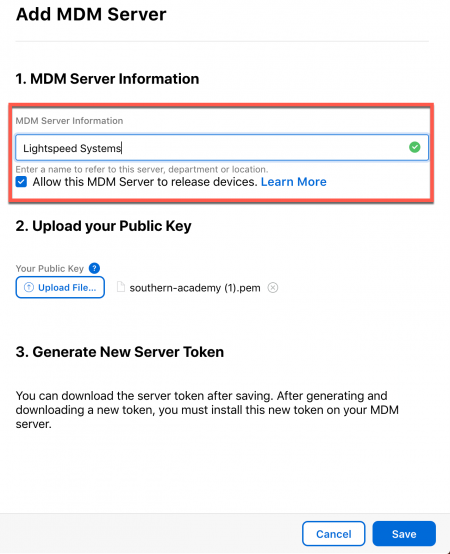 Follow the steps below to configure DEP. Please note devices purchased more than 3 years prior to the date of your DEP enrollment are not eligible. Instructions to enroll devices into the Apple DEP program. How to setup and configure devices over-the-air (OTA) with DEP. And provide access to Apple’s Device Enrollment Program Guide. 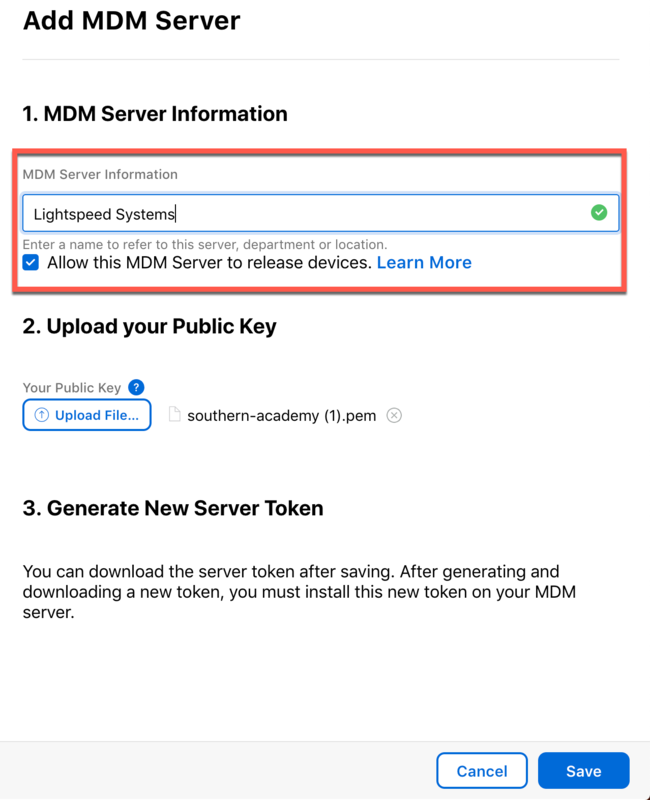 Once your district is successfully enrolled in the Apple’s Deployment program, login into Mobile Manager and navigate to the district, school or group you want to enroll your devices. 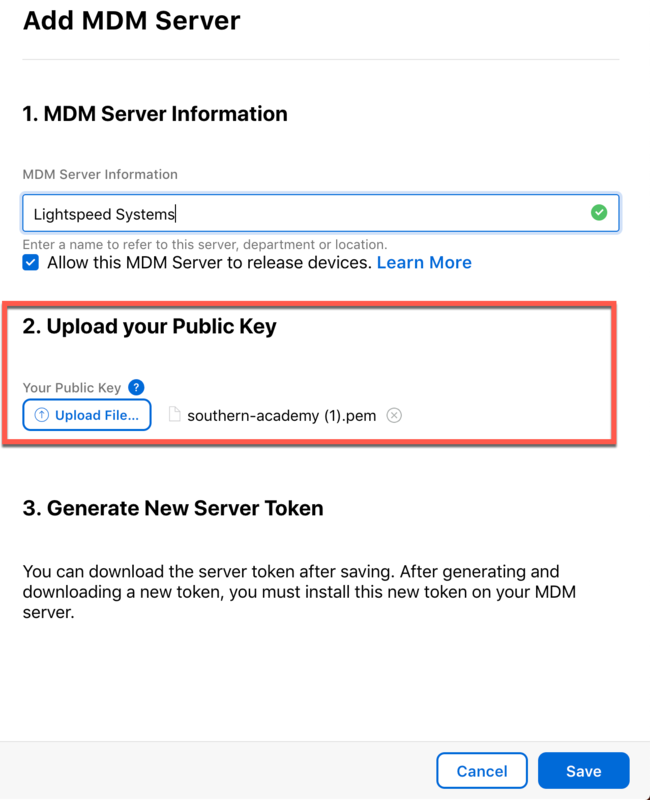 Once your district is successfully enrolled in Apple’s Deployment program, login into Mobile Manager and navigate to the district, school or group you want to enroll your devices. 1. Click Settings and then Apple DEP. Click on certificate under Download Certificate to download the Mobile Manager (PEM) certificate. 2. Next, log in to your ASM account (with the Apple ID tied to your organization). 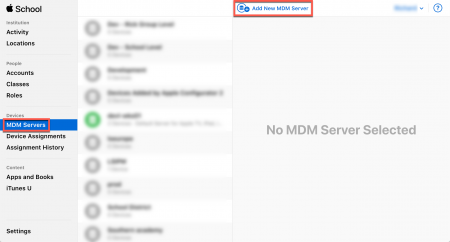 Navigate to MDM Servers then click Add MDM Server. 3. Give the server a name. 4. 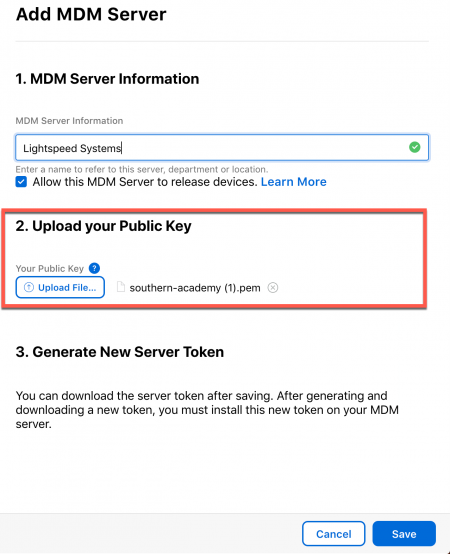 Upload the PEM certificate file that was downloaded from Mobile Manager in Step 1, then click Save (this opens the new MDM server’s info panel). 5. Click Download Now to download the token (a .p7m file). 6. Navigate back to the enrollment group in Mobile Manager, select Settings, and then Apple DEP. Under Upload Credentials, give the file a name and click Add Credential to upload it to Mobile Manager. Save the file, as you will also be using it when syncing with Apple School Manager in the next section. 7. You can set a variety of Apple DEP settings and deploy the profile to your devices after uploading the credentials. You now have the ability to create a profile. Select Build Enrollment Profile and choose the appropriate settings. Click Create Profile. Profile Name If needed, enter or edit the profile name. Allow Pairing Check (select) this option to allow device pairing. For example, enable this option to allow Bluetooth device pairing. Supervise Devices Check (select) this option to put iOS devices in Supervised mode. Mandatory Check (select) this option to make Mobile Manager profiles on devices mandatory. Removable (by user) Check (select) this option to let users delete profiles on their devices. User Support Phone Enter a phone number for the profile for users to call. Department Enter a department name for the profile. 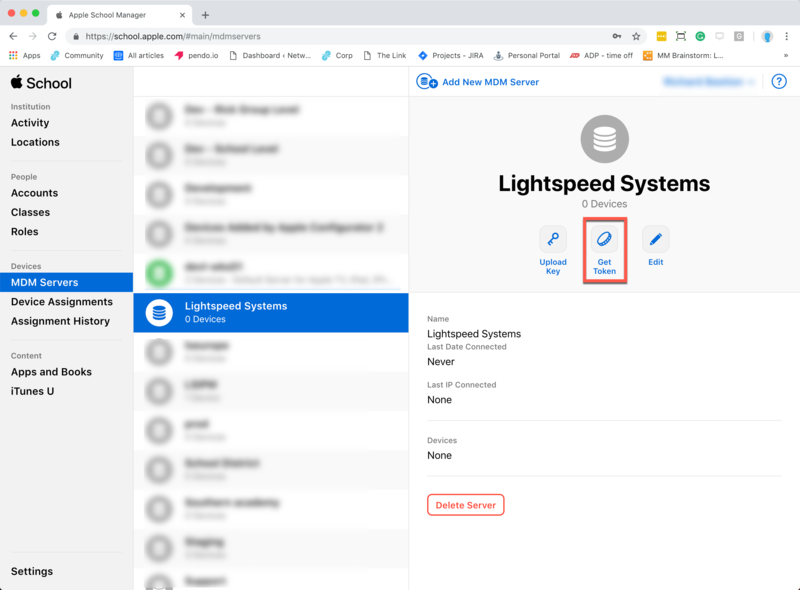 Skipped Setup Items Check (select) the setup options (Passcode, Location, Restore, AppleID, Terms and Conditions, Siri, and Diagnostics) to skip during the device setup process for users. Skipping unused options can both shorten and simplify the setup process. Last, click Deploy Profile. You can then select certain devices or all devices. From the Assign Profile dropdown list select a profile and then click Assign Profile to associate this profile with selected devices or from the Assign Profile dropdown list select a profile and then click Mass Assign Profile to associate this profile with all devices. Current devices will have to be restored to factory default and go through the setup assistant in order to take advantage of DEP. Newly-purchased devices that have not gone through the setup assistant will automatically be enrolled in the group in which you setup DEP. You can also view enrollment profile details as shown below. Organization admins can also remove enrollment profiles and update their credentials. To view enrollment profiles click Profile List. Click on Remove to remove the uploaded ADP credentials. Next Step — Sync Apple School Manager with your SIS database.